Musical CATS China Tour 2019 in Nanjing will be held at Opera Hall, Jiangsu Centre for the Performing Arts from July 30 to Aug.4, 2019. One must-seen show in a lifetime. The most popular musical ever since the first performance. Translated into 15 languages, has toured around more than 300 cities in 30 countries. Over 20 thousand performances have engaged 81 million audience. Cats is a musical composed by Andrew Lloyd Webber, based on Old Possum’s Book of Practical Cats by T.S.Eliot and produced by Cameron Mackintosh. Directed by Trevor Nunn and choreographed by Gillian Lynne, Cats first opened in the West End in 1981 and then with the same creative team on Broadway in 1982. It won numerous awards, including Best Musical at both the Laurence Olivier Awards and the Tony Awards. The London production ran for 21 years and the Broadway production ran for 18 years, both setting new records. 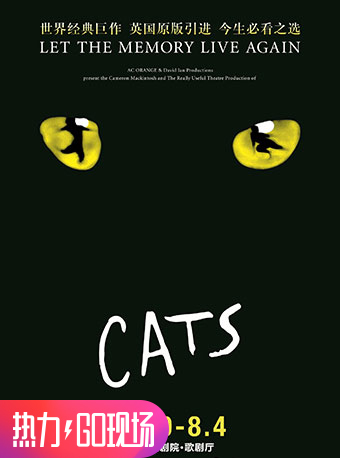 As of 2016, Cats is the fourth-longest-running show in Broadway history and was the longest running Broadway show in history from 1997 until 2006. Cats is the sixth-longest-running West End musical. Actresses Elaine Paige, Betty Buckley, Sarah Brightman have become famous because of Cats. The most famous number “Memory” was recorded by over 150 artists with more than 180 recording editions. Only in the UK, Memory was played on TV and radio programs for more than 46,875 times. With the highest standard of cast and creative team, Cats China tour will present the authentic West End residential theatre experience. Cast members are top artistes selected from all over the world. Choreography, setting, costumes and props are all upgraded for a remarkable China Tour. The musical tells the story of a tribe of cats called the Jellicles and the night they make what is known as “the Jellicle choice” and decide which cat will ascend to the Heaviside Layer and come back to a new life. The Phantom of the Opera, Cats, Evita, Jesus Christ Superstar etc.